Output 85.2.1 shows the sequence of models produced by the FORWARD model-selection method. The final variable available to add to the model, RestPulse, is not added since it does not meet the 50% (the default value of the SLE option is 0.5 for FORWARD selection) significance-level criterion for entry into the model. The BACKWARD model-selection method begins with the full model. Output 85.2.2 shows the steps of the BACKWARD method. RestPulse is the first variable deleted, followed by Weight. No other variables are deleted from the model since the variables remaining (Age, RunTime, RunPulse, and MaxPulse) are all significant at the 10% (the default value of the SLS option is 0.1 for the BACKWARD elimination method) significance level. The MAXR method tries to find the "best" one-variable model, the "best" two-variable model, and so on. Output 85.2.3 shows that the one-variable model contains RunTime; the two-variable model contains RunTime and Age; the three-variable model contains RunTime, Age, and RunPulse; the four-variable model contains Age, RunTime, RunPulse, and MaxPulse; the five-variable model contains Age, Weight, RunTime, RunPulse, and MaxPulse; and finally, the six-variable model contains all the variables in the MODEL statement. The above model is the best 1-variable model found. The above model is the best 2-variable model found. The above model is the best 3-variable model found. The above model is the best 4-variable model found. The above model is the best 5-variable model found. Note that for all three of these methods, RestPulse contributes least to the model. In the case of forward selection, it is not added to the model. In the case of backward selection, it is the first variable to be removed from the model. In the case of MAXR selection, RestPulse is included only for the full model. 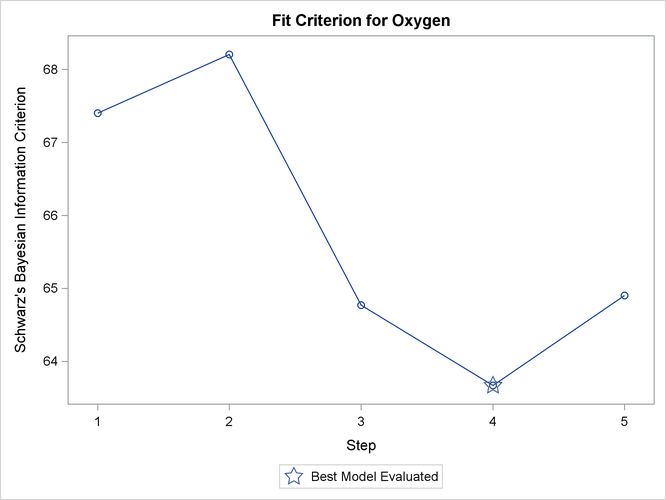 For the STEPWISE, BACKWARD, and FORWARD selection methods, you can control the amount of detail displayed by using the DETAILS option, and you can use ODS Graphics to produce plots that show how selection criteria progress as the selection proceeds. For example, the following statements display only the selection summary table for the FORWARD selection method (Output 85.2.4) and produce the plots shown in Output 85.2.5 and Output 85.2.6. Output 85.2.5 show how six fit criteria progress as the forward selection proceeds. The step at which each criterion achieves its best value is indicated. For example, the BIC criterion achieves its minimum value for the model at step 4. Note that this does not mean that the model at step 4 achieves the smallest BIC criterion among all possible models that use a subset of the regressors; the model at step 4 yields the smallest BIC statistic among the models at each step of the forward selection. Output 85.2.6 show the progression of the SBC statistic in its own plot. 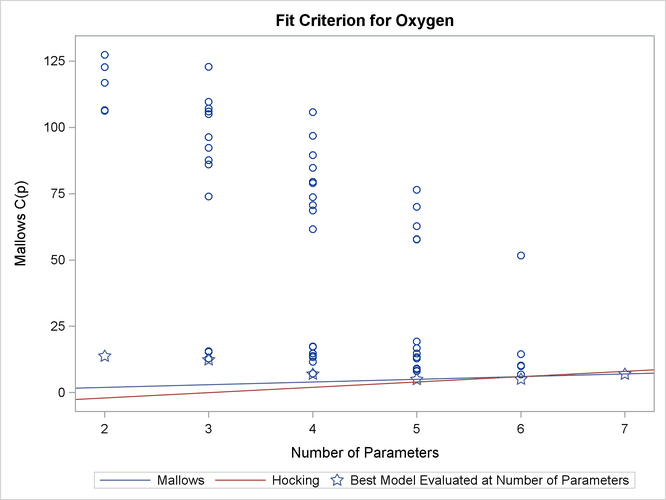 If you want to see six of the selection criteria in individual plots, you can specify the UNPACK suboption of the PLOTS=CRITERIA option in the PROC REG statement. The models in Output 85.2.7 are arranged first by the number of variables in the model and then by the magnitude of R square for the model. 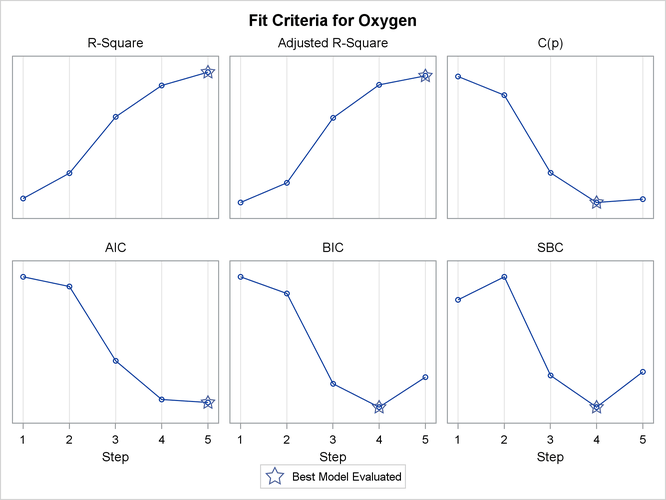 Output 85.2.8 shows the panel of fit criteria for the RSQUARE selection method. 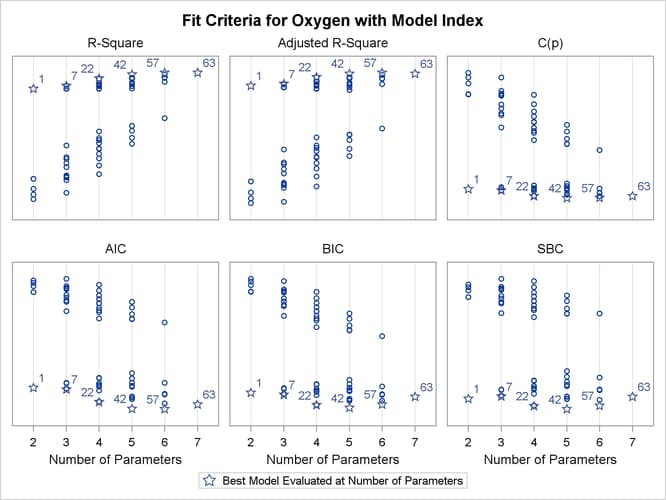 The best models (based on the R-square statistic) for each subset size are indicated on the plots. The LABEL suboption specifies that these models are labeled by the model number that appears in the summary table shown in Output 85.2.7. Output 85.2.9 shows the plot of the criterion by number of regressors in the model. Useful reference lines suggested by Mallows (1973) and Hocking (1976) are included on the plot. However, because all possible subset models are included on this plot, the better models are all compressed near the bottom of the plot. Output 85.2.10 shows the summary table listing the regressors in the 20 models that yield the smallest values, and Output 85.2.11 presents the results graphically. Reference lines and are shown on this plot. See the PLOTS=CP option for interpretations of these lines. For the Fitness data, these lines indicate that a six-variable model is a reasonable choice for doing parameter estimation, while a five-variable model might be suitable for doing prediction. Before making a final decision about which model to use, you would want to perform collinearity diagnostics. 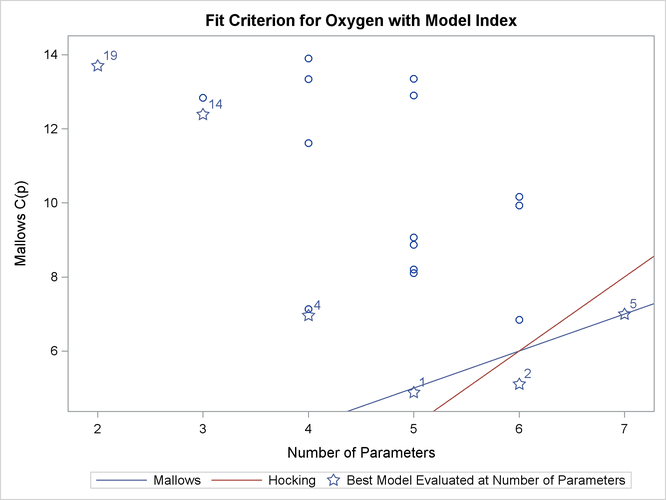 Note that, since many different models have been fit and the choice of a final model is based on R square, the statistics are biased and the p-values for the parameter estimates are not valid.